This entry was posted in Candy and Confections, Food and Recipes, Food Presentation, Seasonal, Winter/Christmas and tagged Chocolate chip, Christmas, Coconut oil, Confectionery, peanut butter on December 10, 2012 by nancyc. I love these Flag Cupcakes, decorated in a simple and easy way with piped blue buttercream dots and red licorice stripes! 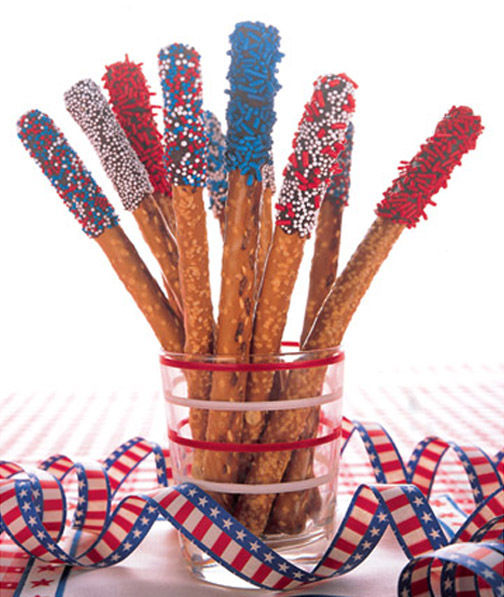 These Pretzel Sparklers are a lot of fun, too! All you do is melt 4 ounces of semisweet chocolate, then coat the top third of each pretzel rod with the chocolate, using a pastry brush. Cover with sprinkles, stand upright in a glass and refrigerate about 5 minutes, or until firm. You could also use white chocolate instead of semisweet chocolate and add some edible glitter to make them more sparkly if you want. 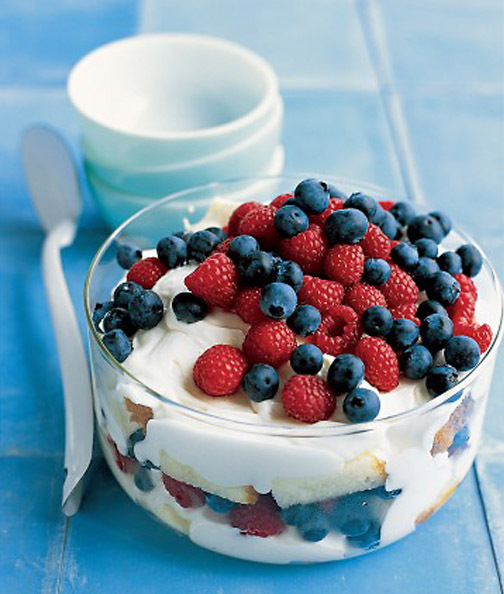 Here’s another Red, White, and Blueberry Trifle…this one is made with cream cheese; the other trifle (the first photo in the post) is made with mascarpone cheese. 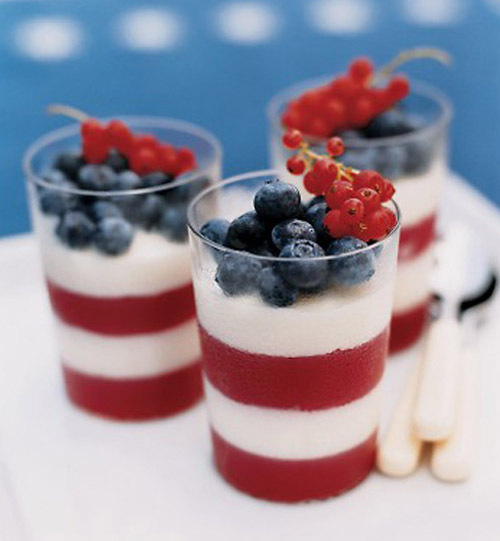 These Red, White, and Blue Parfaits look cool and refreshing with their red and white striped layers! 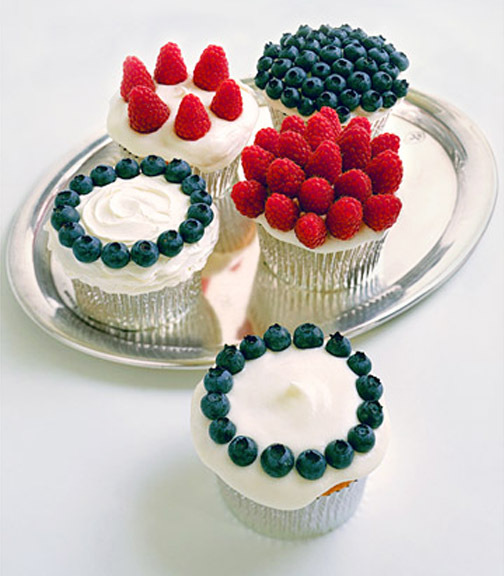 I like the idea of using raspberries and blueberries to decorate these Fouth of July Cupcakes…such a simple and easy idea, and so pretty! 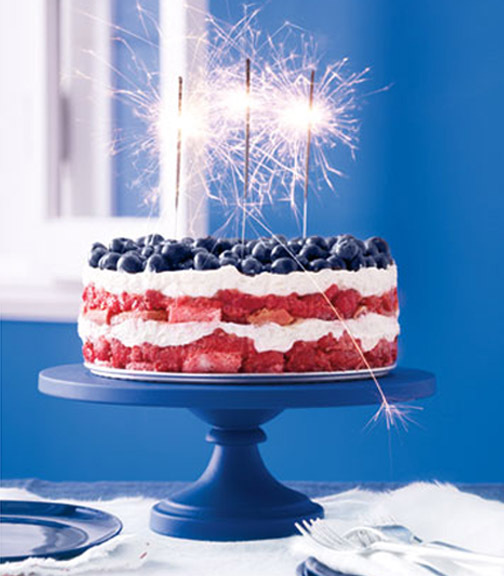 These are just a few of many ideas at MarthaStewart.com…there are 30 fun and patriotic ideas for you to take a look at! 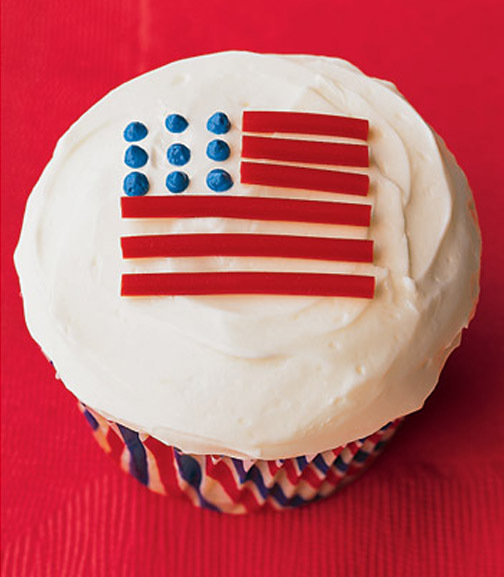 Wishing you a sweet Fourth of July! What kinds of treats will you be making for your celebration? This entry was posted in Cupcakes, Entertaining, Food and Recipes, Food Presentation, Other Desserts, Seasonal, Summer/Summer Holidays and tagged berry trifles, blueberry, cupcakes, dessert, Independence Day on July 1, 2012 by nancyc.